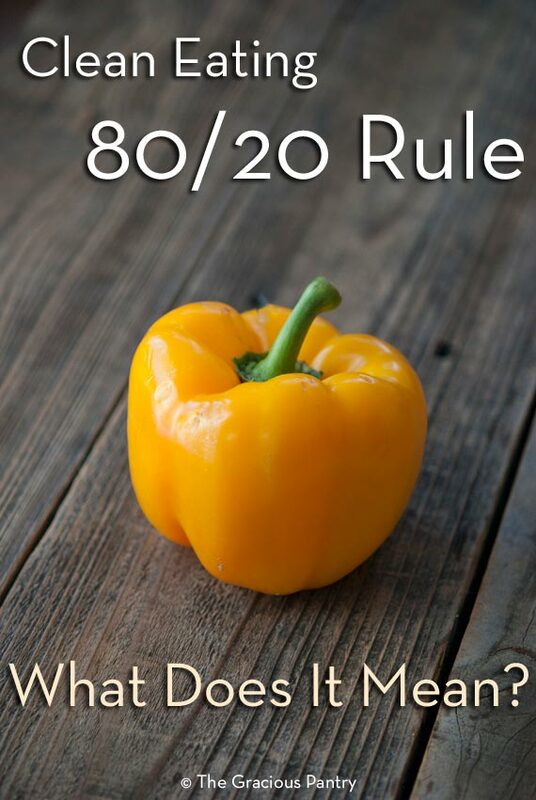 The 80/20 rule. We talk about it, we mention it in reference to moderation and cheat/treat meals. But what does it actually mean? What do 80 and 20 percent look like in a day, a week or even a month? The working theory is this: When you eat clean, you have to allow for life to happen. That, in theory, should equal about 20% of your overall eating plan, max. So you eat 100% clean, 80% of the time, and allow for mistakes and special occasions the other 20% of the time. I started thinking about that rule the other night and realized that while I talk about it a lot, I never really pictured what that would mean for my own meal plan. I always figured if I had 1 treat meal a week and a little something extra during the holidays, that I was fine. And I was! But I still didn’t have a very strong image in my head of what that 20% would look like for me. If you intend to eat clean long term, you simply and absolutely must enjoy special occasions and not beat yourself up for every little “mistake”. Because the truth is, there are no mistakes where food is concerned. There are only decisions. The decision of what to put in your mouth. And if you decide to put something less-then-clean in that mouth of yours, you should enjoy it! Make sure it’s not happening all the time, of course, but enjoy the heck out of it! Mentally, it’s a much healthier approach to food and it also helps you remember that when you go home and make a chicken salad, you aren’t going to starve or never have pizza again. That, my friends, is a lifestyle instead of a diet. And that is the 80/20 rule. So if you are like me, you want an exact number. So here are the numbers in all their 80% and 20% glory! 20% of 21 meals is a tad over 4 meals. Perhaps 4 meals and 1 snack. 20% of 42 meals is almost 8 1/2 meals. So maybe 8 meals and 2 snacks. Now some people may see these numbers and wonder how anybody could lose weight or get healthy with that much “cheating” while others will breath a sigh of relief. Just keep in mind that those numbers are simply a range you can work within. These days, because I’m eating low carb, I only eat 3 meals per day because I just don’t need that much food. But if I were to eat spaghetti and garlic bread at the Old Spaghetti Factory 4 nights a week… well…. that may not be such a great idea. At least not for me personally. It may be perfect for you and your lifestyle! But what these numbers really do is allow life to happen. So if I’m eating 100% clean for those first 17 meals and then my son wants to have Baskin Robbins one night after dinner, guess what? We are probably going to head down to Baskin Robbins. Will this become a habit 4 nights a week? Of course not! But on the rare occasion we do something like that, it allows me to enjoy it without feeling guilty. Remember, it’s a lifestyle, not a diet. NEED SOME COACHING TO GET STARTED OR BACK ON TRACK? These self-paced 8 lessons will guide you through getting started with clean eating. Receive 90 days access to 8 content pages with audio and downloads as well a access to a members-only forum where you can ask all the questions you need to ask about clean eating. Get more info here. You explained this and broke it down so well. It’s great – thanks! Erena – Thank you! I’m happy you enjoyed it! I’m embarking on the clean eating journey and this was super helpful. I had had something similar in mind and this was great confirmation. Thank you for sharing! I like that you say 3 meals a day! So much always says 5-6 meals a day and I can’t do that with my schedule! This simplifies it down. Would you ever do a sample menu? Thank you! I would GREATLY appreciate that!!! Does eating clean help you to lose weight? Grace – It can, yes. You still have to watch your portion sizes, but it does help many people, yes. I always say, eat clean at home, and enjoy the occasional treats when you are out, but you can’t have it all! Stay within the boundaries, and you will reap the benefits. How strange, I did the calculations yesterday with my mother and came accross your article today on Pinterest! I agree with you, the 20% can seem huge if you previously aimed to eat clean almost all of the time. As of my next meal, I’ll be recording how that works for me in my planner and see if I see any difference. I’m not sure if I’m eating clean 80% of the time (probably not to be honest) so this will be an interesting experiment! Wow- this was SO very helpful – and really puts things into a healthy (mentally) perspective!! Can I practice 80/20 and still have a serving and a half of m and ms at bed time / over night? They help me sleep and I try to have a high protein low carb dinner with them and a light morning pre exercise snack. Jessica – That’s totally a personal choice. Does it feel right to you? You might also ask yourself why something like that (loaded with sugar) would help you sleep when it would give most people more energy, making it harder to sleep. Is it blood sugar related? Is there something else going on? But again, totally a personal choice. I’m not here to judge or tell you what’s right or wrong for you. If you are comfortable with doing that, than go for it! Finally, a clear and concise answer on how to do this. It made no sense to me before. Thanks much. I look forward to reading your blog.